Three colour print technology is based on the principles of the subtractive colour model whereby magenta, cyan and yellow pigments are combined to create pigments that absorb certain wavelenghts of light. We begin with a white background and mixing gives us a full palette of subtractive colours. Why not use it to create a trivariate thematic map which illustrates the density and overlap of certain features as they occur in the environment. This map uses equally sized circle symbols representing three separate features in San Francisco. While they possibly cannot be said to correlate to one another in a causal sense we get a clear idea that trees signify a particular type of landscape, that cabs tend to concentrate in the north east and the downtown area and that crimes occur throughout. Interestingly, the mixing of the subtractive colours gives us reds, blues and greens showing the predominance of two of the variables…and occasionally some black showing the presence of all three in close proximity. 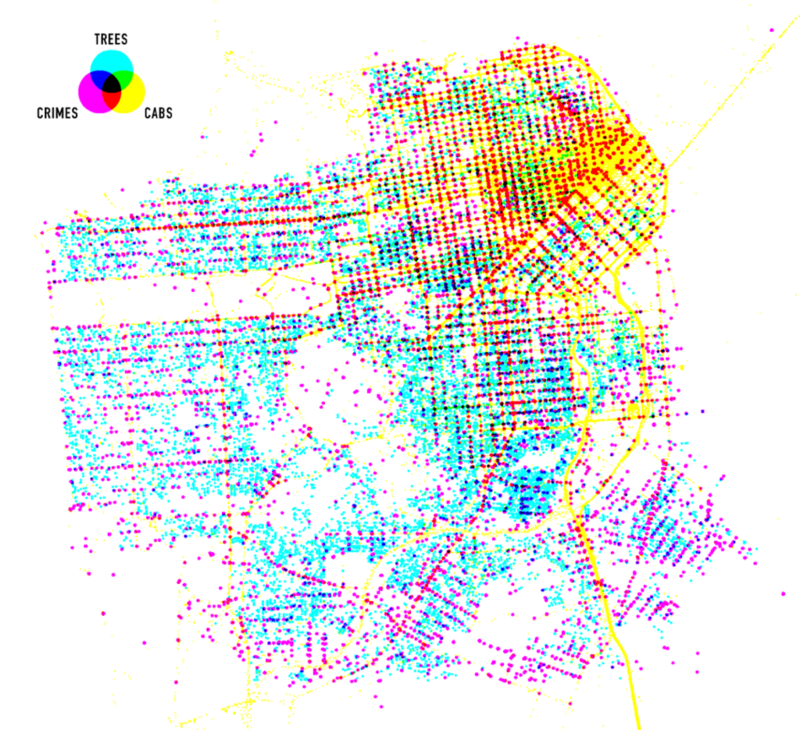 Crime tends to appear on east-west streets rather than north-south but the main outcome of the map is to see the city through a different lens through subtractive blending. A neat reworking of a well established technique that creates a visually interesting map and one which perhaps has further utility. A web map version can be seen here. This entry was posted in MapCarte and tagged abstract, artistic, MapCarte, web map by @kennethfield. Bookmark the permalink.